Honesty is the best policy. And Kevin Hotaling isn’t holding back. 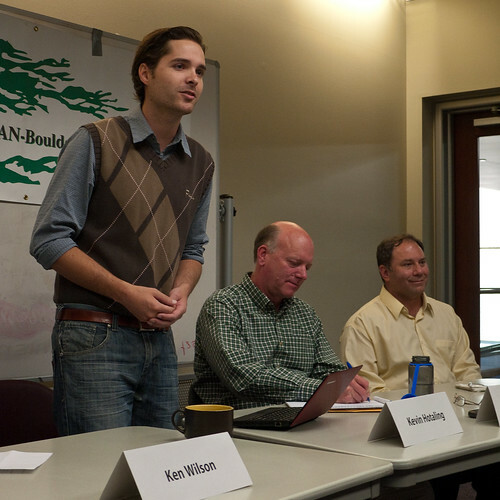 The 29-year-old Boulder City Council candidate is taking a second run at City Council after participating in the 2009 city elections. The current leadership, he said, is too timid. “People are tiptoeing around trying to make sure different voter blocks are appeased… instead of actually considering the problem and confronting it,” Hotaling said. Hotaling said his honest voice would help expose the current flaws in Boulder’s system and help move the city forward. Hotaling said he feels the city’s energy supplier debate, for example, needs to be better evaluated. He said he feels the current council is spending too much time debating the controversy and not enough time looking ahead. Hotaling said he hopes Boulder’s energy moves toward solar power. “In 20 years what I want to see is a quarter of [Boulder’s] energy be supplied by behind-the-meter solar power,” he said. Hotaling also looks to use his background in web design and marketing consulting to improve the city. He said he wants Boulder to tap into its deep pool of web programmers to move the city into the 21st century. “[Boulder has] the most developers per capita; someone needs to make that connection,” Hotaling said. A better connection, Hotaling said, needs to be made between the college community and city council as well. “I can’t stand the way they treat the kids around here,” Hotaling said. He said he feels the city needs to change their negative perspective of the Hill. Hotaling said he thinks tough drinking enforcement does not improve situations on the Hill, but instead worsens them. Much like with the energy debate, Hotaling said, the council needs to step back and “have an adult conversation.” The 29-year-old, however, said he knows his age may be a disadvantage in the election. “Boulder’s political system is very much one of earn your stripes and prove your loyalty,” Hotaling said. While time may not be on his side, Hotaling said he hopes to prove himself to Boulder’s older community in other ways. He said he plans to use his experience from running for council two years ago to help him in this year’s campaign. “I have to win them over on a number of levels, particularly running a traditional campaign, which is something I didn’t do last time,” he said. But most of all, Hotaling said he wants voters to pay attention to his views and not his birthdate. “I’ve got convince people it’s not about age, but perspective,” Hotaling said. For more information on Councilman candidate Kevin Hotaling visit www.kevinhotaling.com.